Pontoon boats assembled from kits require no welding and come with easy to follow instructions. If you like boat building, then this is for you. Choose from various sizes for the application that best suits you. Kits are easy on the pocket book and are very simple to assemble. 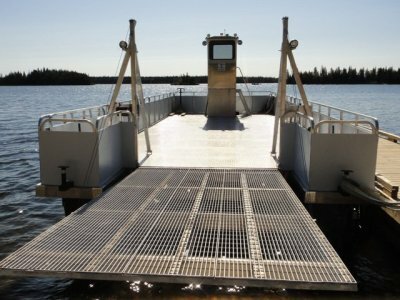 Aluminum pontoons are safe, economical to use and provide a safe and stable platform for all applications. Build your own Pontoon Boat for pleasure and work related applications. They are ideal for fishing, scuba diving, work boats and as houseboats. 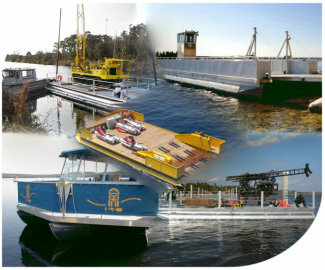 Commercial pontoon boats can be used for many applications. They are used as utility boats, as tour boats, barges and for other commercial marine applications. Kits can also be used for building docks and rafts. Need a pontoon boat for a specific application such as commercial fishing, heavy duty hauling, pleasure or other uses, this boat kit is for you. With your pontoon boat, you can go fishing, scuba diving, vacation on the water or just relax and enjoy life with your family and friends.
" Kits can be manufactured according to your requirements"
One of Our Most Recent Kits "View More"
We can supply custom kits for enviromental clean up applications, Tri-pod systems, heavy duty workboat kits, passenger, bike ferry, water taxi, multiple pontoons for floating cottages, tennis courts etc. they can also be used in the farm industry for carrying tractors and equipment even live stock. If you need help in selecting what size is right for you contact U-Fabboats and one of our Representatives will be more than happy to help. Docks and raft kits are quality constructed to endure many years of use. Each pontoon has a solid welded baffle every 5' or less and Ramps are available up to 20' long. Use our docks to tie up that houseboat or work boat you just built. Aluminum railing and other optional accessories are available to give your finished boat all the luxuries of home. If you need pontoon accessories, carpet or just a steering wheel, we can supply one. Just what you need to finish your boat. If you need to transport your finished product check our trailers for the one that meets your needs. Fish Harvesting Boats are also available in kit form and are primarily used in the Aquaculture industry. High capacity nose cones are designed to be used where more boyancy is required at the front of the pontoon boat. Ideal for work boats where a davit or gantry crane is being used. Electric motors	can be used with pontoon boat kits instead of conventional motors. Our aluminum pontoons are made with type 5052 H32 , an aluminum / magnesium alloy most resistant to corrosion in fresh and sea water. The standard pontoon wall thickness is.125".There are solid welded chambers every 5' and each pontoon has a full length under keel and side keel for added protection. U-Fab Boats is continuing to be the leading supplier of pontoon boat kits, work boats, tour boats and with our Aluminum fabricating experience we supply Craftsmanship, Quality and Value.